Ah yes, its that time again, the leaves are sprouting on the trees, the daytime temperatures are warm and breezy and any minute it’ll be time to uncover the pool and whip out the barbecue grill. How much of a project your summer set up will be, depends a little bit on the kind of grill you have. Well here’s a grill that provides instant cookout pleasure anywhere you decide to set it up. This stainless steel grill folds as flat as a pancake, hence the name, the Fold Flat Grill. The Fold Flat is less than an inch thick for unmatched portability when folded and unfolds to a rather surprising 17 3/4″ L x 13″ W x 13″ H, ideal for tailgates, picnics, beaches, or simply at home. 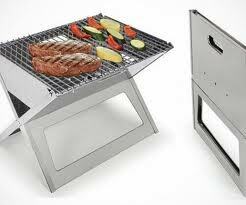 The Fold Flat Grill provides around a 17 1/2″ x 13″ W cooking area, a good size for up to six filets, chops or hamburgers. Two triangle-shaped vents on either side and three vent holes let air into the charcoal well that also serves as a receptacle for easily emptying the ash. The sloping sides of the grill provides a 3″ shelf on both sides for the indirect heating of stuff like veggies and buns. So if you’re ready to head out to the beach, the woods or just have limited storage space in your camper or at your apartment, the Fold Flat Grill could be a fun option. The Fold Flat Grill is available from our friends at Hammacher.com for under 80 bucks. I’ll bring the chips and beer.